Beaufort County is in eastern North Carolina near the coast, bifurcated by the Pamlico River. Notable towns are Bath, the oldest in North Carolina, and Washington, affectionately called “Little Washington” by natives. Outside of Washington, the county is very rural. Like most eastern North Carolina counties, Beaufort contains a high black population. According to the 2010 census, Beaufort was over a quarter black. Yet the black population is in decline and they are being replaced in the electorate by Hispanics, who are less likely to vote. Whites continue to represent 68% of the electorate. This demographic situation is unusual for eastern North Carolina, where the percentage of whites has been on decline for years, and is probably due to Beaufort’s dual identity as both an eastern and a coastal county. Because whites in eastern North Carolina vote overwhelmingly Republican, Beaufort is a solid Republican county. 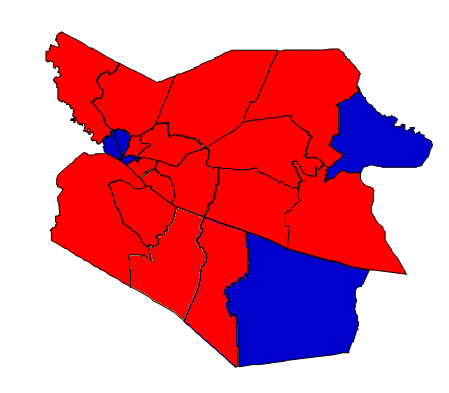 Beaufort is also polarized by race and is an example of an inelastic county. As a rule, whites vote Republican and blacks vote Democrat; there are few swing voters. Prognosis: Beaufort County is rated “Solid Republican” and has been that way since the mid-1990s. One thing benefiting Democrats recently has been the high turnout from black voters as a result of Barack Obama’s candidacy in the past two elections. Democrats will need to find a way to get black voters to come out without Obama on the ticket. Even if they succeed in this effort, they will have a hard time cracking 40% of the vote here.